Your photographs are always very magical Arpita. Congratulations on the top ten finish with this beauty! You sure had a great year of shooting in 06. Congrats on top 10! WOW Arpita!! You have some wonderful photographs including this top 10 pick. Congratulations! Excellent image and congratulations on your high finish! I gave this an 8. Very nice - well photographed, including control of the depth and colors. Wow, I'm so jealous - I'm assuming this is antelope canyon? I've been wanting to visit for a long time! What a beautiful shot and great capture of very difficult lighting conditions. 8.
i'm sorry, i just can't look at this without feeling pangs of jealousy. it's such a beautiful place, and i really don't know if i'll ever see it with my own eyes. thanks for sharing it. very nicely done. Excellent capture and timing of the sun. Beautiful! i am just jealous of anyone who is able to get these kinds of shots!!!! But just beautiful! This is a magical shot - the lighting and the colors are so robust. My pick for a top 5 finish. A popular subject, but one that one never tires of, especially if it is done well, like here. A magical place that I would love to experience one day. For now, I content myself with images such as this, which displays the splendor and beautiful light found amongst these magnificent boulders. Well done! Great shot of a truly magical place. One of these days I will make it to Antelope Canyon. Photos like this only make me want to go there more. Beautiful light and color. Sweet! The bit of dust helps reveal the shaft of light without blocking too much of the background. Excellent control of the light and contrast. I have read about the canyons and the weird shapes water has carved through them. The lighting is superb, the colours magical and overall the abstract nature of the photo lift it above many others. Well done. I believe this is a sacred spot for photographers! I would love to visit here someday. The mist in the light is amazing. It is magical and a great pleasure to ponder. An image like this almost makes one believe in magic! Were you granted three wishes? A classic shot. Very beautiful. I'd love to visit this place sometime. Great capture. Some day I wish to visit this place. I've seen shots from here before, and they always amaze me when done well. And this one amazes me. A very fitting title too. (maybe the shots I've seen before are yours also, I don't know, but very, very cool) Great job! No matter how many times I see photos of this, I never get sick of them. Fantastic capture! Someone has been beamed up! Nice to see the dust cloud inside the sunspot, beautiful rock formation..never get enough of seeing this! Shot many times, but gorgeous just the same. Quite a magical place, I'd assume. I've seen these a million times but again, another stunning capture. Well done. Great! It really took my eyes a second to focus and figure out what was going on. As it was loading I thought it was a really low quality image of who knows what and then it finished and I got a good look in and wow! Quite the opposite. Lovely lines and colors. I so want to take a picture like this. Awesome use of light and great capture of the texture. 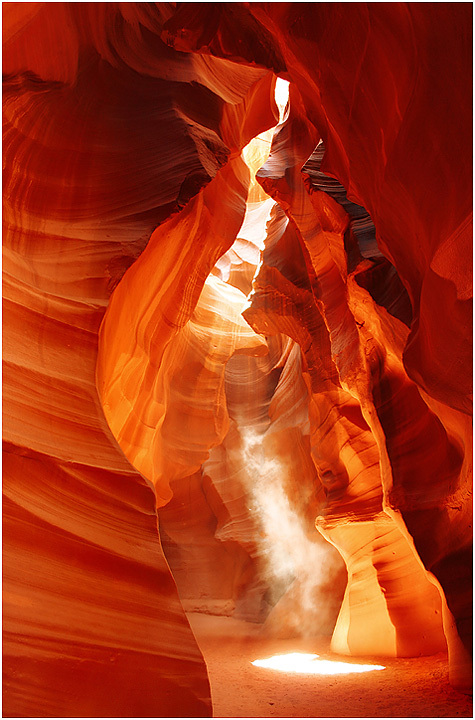 Antelope Canyon, a holy grail for most nature photographers, so cliché but so gorgeous I can help but score it high. Beautiful, the warmth and the color, I love this shot - it's another favorite for me! I have to go to this place!! Wonderful photo. a view from inside my earhole! Lovely slot canyon shot. Is that mist rising? 10 from me. I'm pretty close to this location....I would kill to get a capture of the caverns like this one! Bravo!!!! where is this it is so pretty? Just incredible. I've been developing a serious itch to get to that portion of the country to get shots like this! Too funny. I just saw this today. Or one like it. Great shot btw. I love the details in the walls. Proudly hosted by Sargasso Networks. Current Server Time: 04/19/2019 10:31:27 PM EDT.